Freaky Found! On Fire Island! Last week! Captured on film by the great Long Island wildlife photographer Mike Busch of Great South Bay Images. Image, and knowledge that both Freaky & hope are alive, thanks to Mike Busch. Freaky has not been seen for a few days. As with most fledgling Falcons, the only way we’ll know for sure if she survived is if someone sights her somewhere, someday. My hopes are not high. She wasn’t a great flier, nor hunter, and generally did not seem ready to live on her own. She had been relying on the adults for food, but has not been seen with them recently. Perhaps she died of a broken heart when she lost her new foster sister Bonnie. Yet she had a second chance, and those are precious in this life; especially for a Peregrine Falcon. Regardless of the outcome, she was blessed. She is one of the lucky ones. Now, let’s skip over how wrong I was about Freaky and focus instead on how much I nailed it. I was so right. It all turned out to all be true. The only way we would know for sure is if someone sights her somewhere. Someday. As it turns out, that someone is Mike Busch of Great South Bay Images, and it turns out that that somewhere was Fire Island. And that someday was last week. And yes, I was also right that Freaky is truly one of the lucky ones. Way to go, me. Last summer two fully-flighted but inexperienced Peregrine Falcons had been rehabilitated due to injuries. It was too late to release them back to where they were born, so they were experimentally released at the BOIS Tower on Long Beach Island. 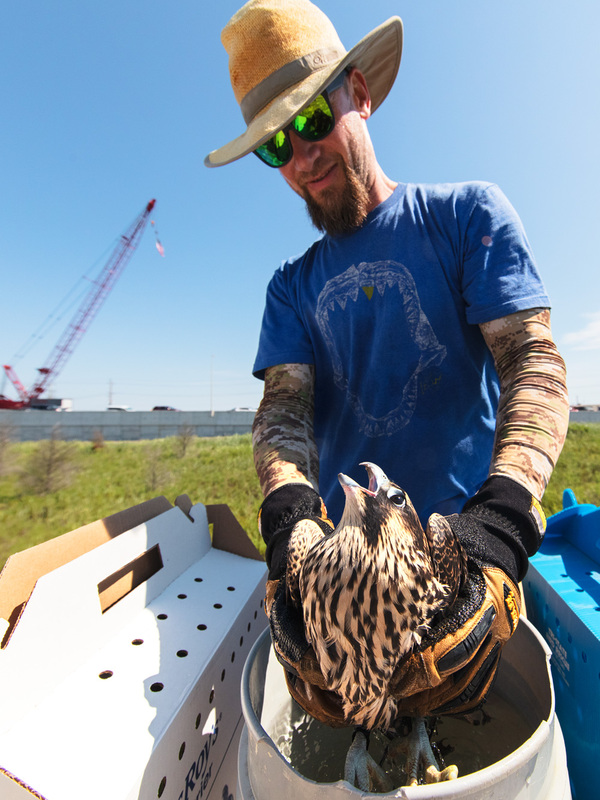 The hope was that LBI’s local falcons might take them in, or at least tolerate them, since the local pair had a youngster named “Blue Bonnet” who was the same age as the two fosters. It was a success; at least in the sense that Jo Durt & Bridgeboy of the BOIS Tower didn’t immediately murder them. Ben Wurst dunks Freaky in a bucket of water before leaving her at the BOIS Tower. The hope was that the water would keep the two fosters from flying off in a panic, and encourage them to rest and acclimate to the area, and to meet Jo Durt & Bridgeboy. But it was only this week when we learned just how successful this fostering really was, when photographer Mike Busch of Great South Bay images saw, photographed, and most importantly, reported, seeing Freaky on Fire Island. Almost everything we know about the long term survival of these animals is thanks to banding. But the effort only pays off if there are a.) resightings of those banded animals and b.) those sightings are documented and reported. Reporting the sightings of banded birds is one of the most important things any birder, photographer, or nature lover can do to help the conservation of endangered species. It’s an uphill battle because there are so few people out there looking, and of those people, only a tiny fraction make the effort to document and report. Reports of banded birds are so much more valuable than most of the people who see them often realize. Every report is precious, and some, like this one of Freaky, even more so. A quick shoutout to the great Allison Anholt who was the first person to teach me how important band resightings are to her precious Oystercatchers, and taught me how important photographers can be to conservation through this function alone. Thank you Mike Busch for your diligence. So what about the other foster, “Blue”? And the other, OTHER foster, “Red,” who I never even did a Reading about because I was so exhausted? Well, now that we know Freaky has been out there (apparently thriving… look at the Woodcock she caught!) this whole time, and we didn’t know zippity-zap about it, we can have hope that it is only a matter of time before a hero like Mike Busch spots, and reports them. Thanks again Mike. For letting us know that both Freaky, and hope, are still alive. In celebration, here is a short little video of Freaky & Blue when they were first dropped off at the BOIS Tower last July. This is their first moment of freedom after long rehabs. It’s Freaky spending most of her time drying her wings and Blue spending most of her time eating the huge pile of quail left for them. I never showed this video because it made me feel nervous and anxious. The future was so uncertain. The risks so high. But now? Knowing Freaky is out there living the amazing life she was born for? Now it makes me chuckle; watching these two, overwhelmed, confused, and energized by their first moments of freedom in a strange place after their long rehabilitations. It reminds me of all of the wonderful surprises which may be awaiting each of us, however uncertain and scary the immediate moments in front of us may feel. 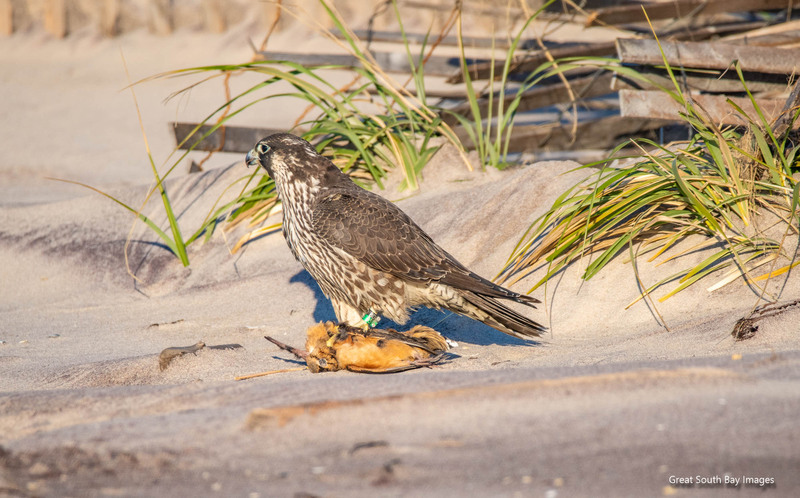 Posted in Wildlife and tagged allison anholt, ben wurst, blue bonnet, bois, bridgeboy, freaky, jo durt, kathy clark, LBI, lbi peregrine falcon, Long Beach Island, pergerine falcon. Bookmark the permalink. Wonderful news, Jim. It makes my heart warm to know Freaky was spotted living her life and thriving. It gives me hope that someone may spot and photograph one of my PIPL godbabies, Small Wonder, Shore Magic and Jean, and report in on them. That would be my best gift ever! What great news to start my day with! Wonderful news! …and GREAT video! Your videos are always superb!